Las Vegas, NV – January 10, 2012 – At the 2012 CES show in Las Vegas, CEntrance, Inc. begins shipping its new Audiophile Desktop(tm) product bundle. The system packs a stereo pair of “MasterClass(tm) 2504″ desktop 2-way coaxial speakers and the “DACmini(tm) PX” desktop amplifier and DAC. The bundle also includes a travel case with custom foam cushioning as well as speaker and USB cables. The Audiophile Desktop system was designed from the ground up to bring Hi-Fi sound straight to the desktop for today’s Internet-connected consumers. The DAC, amp and speakers are closely matched and properly voiced to work in concert. The Audiophile Desktop bundle provides a complete digital audio listening solution for a street price of $2,000 USD and is available for ordering now. The recently released, powered DACmini PX follows in the footsteps of the critically acclaimed DACmini CX, which has garnered glowing reviews from top magazines and websites internationally with its unique “musicality and sonic detail.” Combined with stylish, compact design, it offers an array of useful features, such as analog and digital inputs and 192kHz / 24-bit capability. The new ‘MasterClass 2504′ near field speakers boldly define ‘mastering-quality’ sound for the listener’s immediate environment. While professional musicians have long embraced ‘near-field’ monitors as a standard way to listen during music production and mastering process, the Hi-Fi community’s link to smaller ‘bookshelf’ and ‘computer’ speakers typically falls short of sonic expectations. CEntrance, whose roots are in the Pro Audio community, is changing that with its new system of sonically balanced components. These components include features such as patented ‘Co-planar’ transducer technology (tweeter and bass driver working surface located on the same vertical plane), all-wood speaker construction, an integrated amp with volume control and on-board custom-designed digital 25-watt amplifier. All of this is built with the utmost care for technical integrity and quiet, interference-free performance. Each MasterClass 2504 speaker features a full-range two-way 4-inch transducer, a carefully tuned bass-reflex cavity, a musical cross-over circuit with custom frequency-shaping components and 25 watts of power-handling capability. The speakers are finished in black piano lacquer to match the black anodized finish of the DACmini PX. DACmini PX is a compact DAC with built-in Class A headphone and Class D speaker amplifier designed to perfectly complement the MasterClass 2504 speakers. It’s a preamp and digital to analog converter with multiple I/O options including: USB, optical, coax S/PDIF, analog input and output, and a front-mounted 1/4-inch connector for professional headphones. It features a proprietary JitterGuard(tm) jitter elimination system, and plug-and-play driverless USB connection on Windows, Mac and Linux computers. Galvanically-isolated, gold-plated RCA connectors provide analog input and output. The extended range volume control is matched to the MasterClass speakers and also accommodates a wide array of headphones, from IEMs to professional high-impedance models. 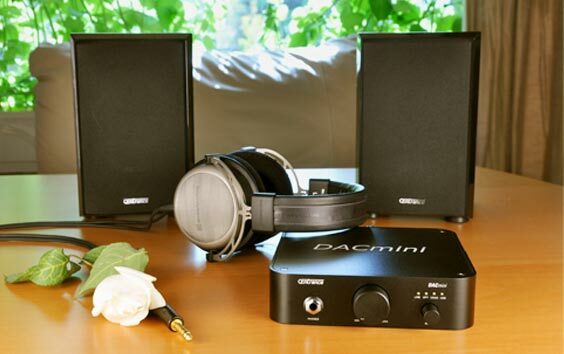 The DACmini PX’s form-factor matches the classic Apple “Mac mini” computer footprint, creating a perfect platform for an audiophile-level music server on your desktop. Using the S/PDIF inputs the DAC features 192kHz 24-bit conversion quality. For the USB connection using ASIO, a free, downloadable CEntrance ‘Universal Diver’ is available from CEntrance. The Audiophile Desktop bundle is available for ordering now at a street price of $2,000 USD.